“Probably man-made objects” spotted near search area. Despite the suspension in January of the underwater search for Malaysia Airlines Flight 370 (MH370), the Australian Transport Safety Board (ATSB) has released two reports stemming from “residual analysis activity” that identified “probably man-made” objects in imagery obtained near the search area. The two reports include analysis of satellite imagery obtained on March 23, 2014, two weeks after the Boeing 777 disappeared over the Indian Ocean during a flight from Kuala Lumpur, Malaysia, to Beijing with 239 passengers and crew. 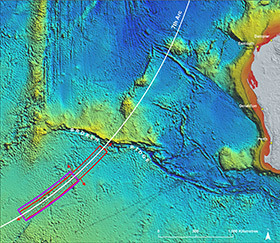 Because the objects were near the underwater search area, the Commonwealth Scientific and Industrial Research Organisation — the Australian government’s agency for scientific research — conducted a drift study, which determined that on March 8, 2014, the day of the crash, the objects could have been in the area previously identified as the most likely location for the 777 to have entered the water. Hood added that information in the two reports would be useful if the underwater search is resumed.